As I was working at my computer yesterday, I had a sudden flashback to our trip to DC in the Spring - Cherry Cupcakes. I don't know where it came from, or how I got the intense urge to recreate it instantly (did I mention I'm pregnant?! ), but promptly at 4 o'clock yesterday I slammed my computer shut and headed to the store for the ingredients. I had everything I needed except cherries, cherry extract and butter. Unfortunately my grocery store didn't have any cherry extract... as I tried to calm the quickly rising panic, I thought - it will be fine, real cherries will be enough cherry flavor, won't they? Maybe they'll be even better? After nicely asking (ok, borderline harassing...) all of the grocery staff members if they were sure they didn't have cherry extract (I even asked the in-store bakery...), I surrendered and figured the real thing would have to do. I know, I could have gone to another store, but the next closest grocery store is 10 minutes away... too much time to waste between me and the finished product. Just as my head had tried to tell my stomach, the real cherries were enough - they were perfect. Subtle and tangy. The almond extract is the real star, especially in the icing. If you have cherry extract, give it a try and let me know how it works out! Prepare cupcake batter as directed. 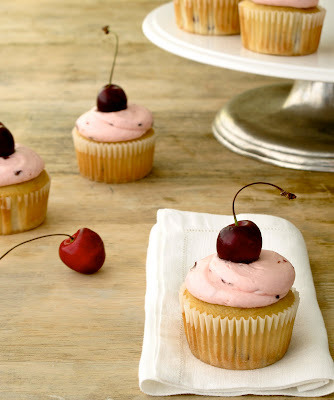 Before scooping into cupcake papers, add almond extract and minced cherries. Stir together. Scoop cupcakes into cupcake papers/tins and bake as directed. For frosting, put butter into your KitchenAid fitted with the paddle attachment. Whip for 30 seconds until smooth. Add powdered sugar and stir together slowly until it has all incorporated. Add cherries, almond extract and food coloring. Whip for 5 minutes on high until light and fluffy. Add more powdered sugar to thicken, or milk to thin to desired consistency. These are so adorable. I just came across your blog and I am in love with it! Great work! Congratulations on your pregnancy. You will have to add a baby blog section to your site. Oh, MY! I knew there was a reason that I decided to follow you after hearing about your blog in the Twitter party last night. These look absolutely SCRUMPTIOUS! These are beyond cute :) And im pretty sure taste even better than they look (if thats possible!) Gorgeous little recipe and your photos never fail to totally blow me away! This will add up to my long list of wonderfully prepared cup cakes. What's this about Mike eating all the cupcakes??? Hey, after you have one it's hard to walk by and not grab another. Wow, it looks very nice. I like it. The flavor looks very good. Keep it up.